Discover Modern Design for modern homes. Mid Century Modern Style Transparent Silver World Globe 12". I've got the world on a string... Travel the world in style with a simple push of your finger. 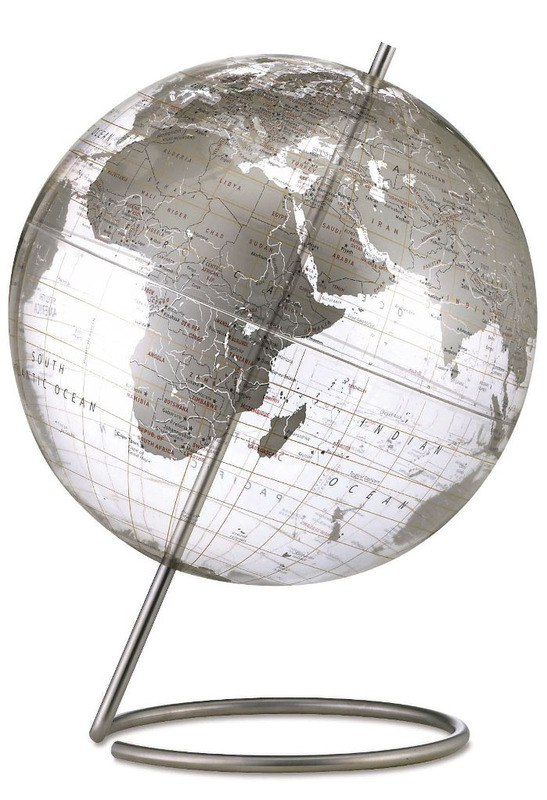 This ultra-cool world globe oozes style and would look amazing on your Mad Men styled executive desk. We absolutely love this Mid Century Modern style transparent world globe with silver metallic printing. Unquestionably the most beautiful globe we have ever seen. This modernist world globe is very similar to the ones you would have seen on an executive desk in 1950's America. Fashioned in the unique modern atmosphere of the 1950s and 1960s, a perfect match to the modern times of Catch me if you Can and Pan-Am. This attractive world globe features stunning silver-colored continents on a printed on a beautiful transparent acrylic globe. This modern world globe has a unique stainless steel axis base which adds a modern twist to your desktop. This modern transparent world globe is a very decorative design object which will certainly compliment any modern interior or office. This is also a perfect children's world globe, sure to please even the youngest stylemakers in your house. This very unique world globe is a great alternative to the more common standard globes, it makes a great unique gift for just about anyone. It measures 12 inches in diameter and stands about 16 inches tall. The most amazing globe will put the world at your fingers, perfect for any occasion; anniversary gifts, birthday gifts, business gifts, christmas gifts, corporate gifts, gift idea, gift, gift idea for children, gifts for him, unique gifts, design, wedding gifts, pure style! Mid Century Modern Style Transparent Silver World Globe 12"
Free shipping within the USA! © MODERNDESIGN.ORG | MODERN DESIGN. Powered by Blogger.